October 20, 2008 – Monday – As we arrive at Lechwe Island Camp, in addition to offering us cool towels, the staff break out into a welcome song! 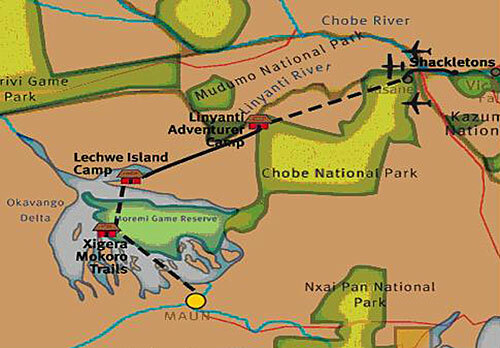 This camp is located in the Moremi Game Reserve Private Concession, and is not as dry as the previous camp. The waterways seem endless as we drive around on safari. There are lots of water birds to see (ducks, geese, herons, wading birds). October 21, 2008 – Tuesday – There was lightning and thunder just before dawn this morning, but no rain. On our safari this morning we spot a Leopard on the far side of a clearing. It was just sitting there looking at us, and then took off into the bush. Victor parked the Land Cruiser and took us on our first walking safari. He was packing a gun, and we were walking single file. Strict instructions from Victor: don’t wander off, and if an elephant charges, stand your ground. He tells us he has never had to fire his gun, and he only armed it once. After we were back in the vehicle, we also saw an Elephant carcass, a herd of Buffalo, and some Kudus leaping and bounding across a spillway. I am fascinated with a pair of Saddle-billed Storks – performing for us, as they land and take off again. They are huge water birds with bright orange beaks and beautiful black and white body colouring. This evening I decide to observe the stars from in front of my tent, since this site is so dark. It must be 1,000 kilometres to the nearest town of any size. The Milky Way is virtually overhead and is a spectacular site. The Large Magellanic Cloud and the Small Magellanic Cloud are both visible with my unaided eye. October 22, 2008 – Wednesday – On our safari this morning we spot an old female Elephant feeding in a clearing by herself. She appears to be near death – her ribs are showing and she has an indented forehead. Victor tells us she is alone because she can’t keep up with the herd. Apparently her molars will also be worn out, so she will have trouble digesting her food, which explains why she is so thin. Sad, but that’s life…and death. Impala are normally very skittish – they don’t become adapted to safari vehicles like other game. Today a group of Impala were preoccupied with something other than us, so I took my best video of this animal (see below for the video). 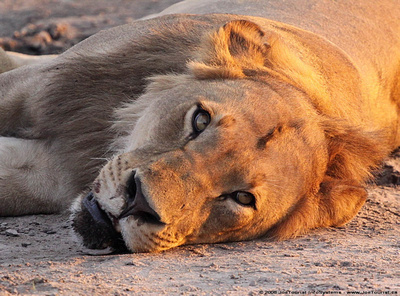 The effects of the Kalahari are never far from travellers to Botswana. Daytime heating can whip up strong, hot winds, especially in the afternoon. After lunch such a wind happened, so I washed a few clothes and hung them out – they were dry in an hour – just as fast as a clothes dryer! We had a special treat on this afternoon’s safari. We came upon a pride of four lions resting beside a water hole. The sun was low in the sky, so we just stayed there and observed until the sun set. It was a magical experience. As we returned to camp in the dark, we saw the eyes of a leopard off in the bush just outside camp. Victor also spotted a scorpion in the road as we were driving into camp, and stopped so we could get a photo. He wouldn’t let us out of the vehicle, because he said this particular scorpion is one of the most poisonous. There is no known anti-venom treatment. When I returned to my tent, there was a Preying Mantis hanging out on the frame of my wash basin – a big bug at about 3cm long! 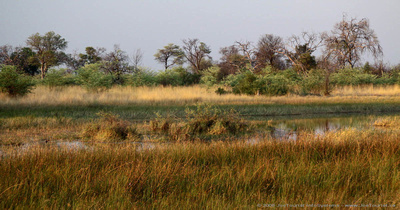 Okavango Delta Wildlife Safari from JoeTourist InfoSystems on Vimeo. October 23, 2008 – Thursday – The morning light illuminates the spillway in front of my tent, making the scene look almost like a painting. Observing the Kudus and Impalas across the water with my binoculars makes the morning that much more sublime. We go on a short canoe trip up the spillway before leaving to catch our noon flight to Xigera Camp. This entry was posted in Botswana and tagged boat, camp, safari, wildlife. Bookmark the permalink.